If you suspect you have rodents, you can contact Kilter for a complimentary inspection. We’ll send highly trained and experienced technicians to your home who will thoroughly check your indoor and outdoor spaces and provide you with an honest assessment. We’ll develop a treatment plan that is tailored to your unique circumstances to effectively and efficiently eliminate rodents. After sealing entry points, we’ll install advanced products, such as RO-DEX, at critical infestation sites. Our team will continue to monitor your home, visiting at regular intervals to perform inspections, remove rodents, and rebait traps. Once we’ve successfully eliminated your infestation, you’ll receive an industry-leading two-year warranty. 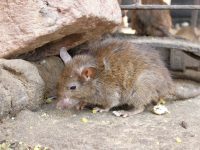 Rodent urine and droppings can cause unsanitary conditions that linger long after rats and mice are gone. Kilter can help restore your home and even remove insulation that may have been nested in and replace it with specialized products that will protect your home from future infestations. Contact Kilter Termite and Pest Control today to learn more about our rodent removal services and to schedule a free inspection at your home in Rancho Palos Verdes, CA, today.